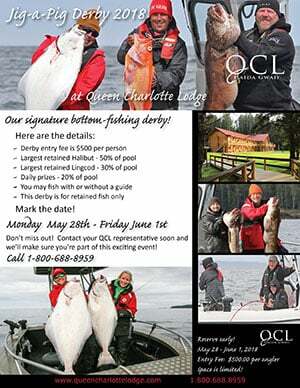 Last June we held our first ever fishing derby targeting only bottom fish – halibut and lingcod specifically – and it was a resounding success! Where salmon has been “king” for decades, we’re certainly seeing our time divided among lots of different fisheries. 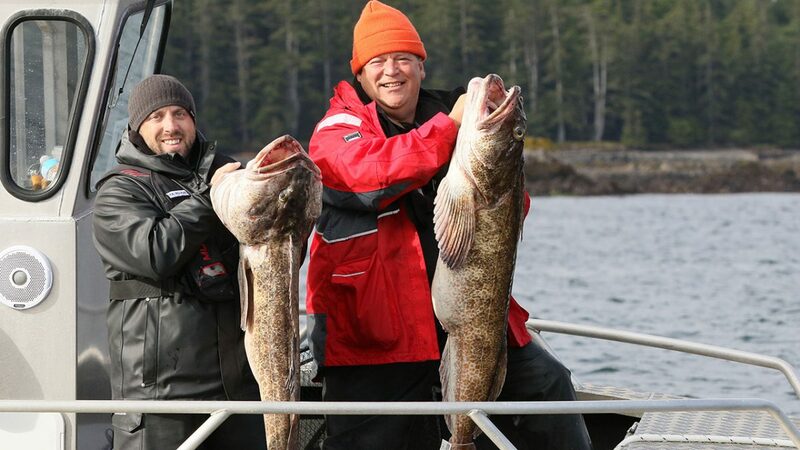 The early season in Haida Gwaii has proven to be an excellent time to go after large-size lingcod and halibut. They have voracious appetites and feed quite aggressively. QCL guests have really taken to exploring the offshore waters and have been jigging up a storm! New and improved depth sounder and GPS technology have added a whole new dimension of experiences to a QCL fishing trip. The 2017 Derby produced some impressive catches last June. John F took the prize for largest Lingcod with a 37-pounder while the largest halibut to the dock for the derby weighed in at 55 pounds for Kyle Q. Anglers in the derby probed around all sorts of structure on our fishing grounds to find a wealth of fantastic bottom fishing. Released halibut were not part of this tournament so some most impressive catches were carefully turned back to swim again. Alan S released a 100-pounder on Wednesday and on Thursday we recorded halibut releases by Keith B – 115 lb. and Jeff F – 118 lb.. A forty-five minute battle concluded early Thursday morning with the measurement of a 78-inch halibut caught by Dana A which translates to 255 pounds! His guide Mark Kasumovich was able to get the proverbial “barn door” stretched out peacefully at the surface long enough to get some accurate numbers along with photos and some video. All in all, it turned out to be a fantastic week. The 2018 Jig-a-Pig Derby is set for Monday June 4th thru Friday June 8th. Many of this year’s participants are booked to return and they’re bringing friends! If you’d like to get in on this fun and exciting event be sure to contact us soon! previousQCL Staff help rescue beached Minke Whale! nextWHEN IS THE BEST TIME TO COME FISHING?